Baseball is so much more to the American way of life than just entertainment. It has provided numerous ways to benefit families and the community. Whether it’s through the personal foundation of your favorite baseball player, or just a local baseball field that brings the community together, this page is meant to connect baseball charities with those who want to support them. Disclaimer: The information on this page is true to the best of our knowledge, and should not be used in place of personal due diligence on the charities or non-profits you choose to support. The David and Erin Robertson Foundation is dedicated to assisting those affected by the tornadoes in Tuscaloosa and throughout the state of Alabama. The foundation strives to lend support to charities and organizations helping those who suffered loss and were affected by this tragedy. 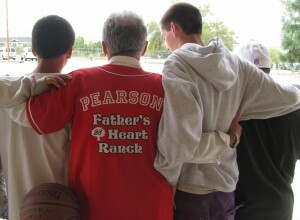 Father’s Heart Ranch is a group home for abused and neglected boys, ages 6 – 12 years old. The children are provided a safe and stable home environment for them so that they can heal from the abuse they have endured. The Hudson Family Foundation is committed to making a positive and long lasting impact in the lives of children who have a genuine need for assistance with regard to a specific physical, emotional or financial circumstance. Philosophy. Our Foundation is based on our Christian values and our strong belief that we should be thankful for our many blessings and give back to those in need. Manner. We will raise funds through an initial personal investment, personal donors, grants, corporate sponsorships, and fundraising events. In 2009, our oldest daughter, Jalyn, was diagnosed with Osteosarcoma. (bone cancer) The journey that our family endured during Jalyn’s treatment was life changing for us. She is now 2 years cancer free and is an inspiration to her friends and family. Seeing firsthand the financial burden that is placed on a family of a child battling cancer, we knew we needed to do something to make a difference. We opened a local chapter of a national non- profit organization , Foundation for Children with Cancer – Jalyn’s Chapter. We raise funds to help the families of children battling cancer with their financial needs. We are able to raise funds anywhere in the country, as we work with Children’s Hospitals all across the nation. Last year we were proud to partner with our Milwaukee Brewers wives as they hosted the 2011 Grand Slam Golden Mixer at Dave and Buster’s. Fans came out to meet the players and their wives while enjoying food, games and an afternoon of fun. We are hopeful to repeat last year’s efforts and raise the bar of proceeds raised. Juan Pierre is passionate to share about the Lord and his own personal testimony of finding hope. All proceeds are donated to charity from his website and sales of Beast Mode for Christ items like T-shirts and wrist bands. Juan Pierre is also the MLB leader for stolen bases. Check out Pierre’s pro tips for base stealing. Youk’s Kids, Athletes for Heros Founded by Red Sox’ Kevin Youkilis – Youk’s Kids new program, Athletes for Heroes brings together professional athletes from each of New England’s sports teams to support the children of fallen or severely injured firefighters, police officers, military men and women as well as courageous citizens who risk their life to save another’s. With funding provided by Youk’s Kids, these children will be able to gain the confidence and camaraderie that Kevin experiences as a team player as well as be provided with opportunities for positive role modeling and mentoring. The Perfect Game Foundation The Perfect Game Foundation works with those who aspire to a business career in baseball by providing mentorship along with financial assistance for internships and courses of study in sports. All-American Girls Pro Baseball League Players Assoc The AAGPBL is a 501C3 charity dedicated to keeping alive the legacy of the women who made history playing professional baseball, and inspired the movie A League of Their Own. Currently, the AAGPBL is fundraising for their 2013 reunion. Purchase the “Wrigley Field Tin” 70th anniversary of the AAGPBL edition using the promo code AAGPBL and a portion of your purchase from Cooperstown Cookies is donated to the AAGPBL reunion. A Christian, faith-based 501 (c)(3) non-profit organization established by Major League Baseball star and Texas native Vernon Wells and his wife, Charlene, to support and protect homeless children and single mothers. A pediatric stroke awareness foundation that sells wristbands to raise funds in order to raise awareness about pediatric strokes and Hemiplegia (a neurological condition that weakens one side of the body) because affected children often don’t get the therapy that could help them due to misdiagnosis. Founded by Sean Lomas, who has a young son that was stricken by a stroke during birth. He is a great kid and loves baseball as much as any kid can. The Good in Sports Positive Sports Media – a non-profit organization devoted to educating the public about the positive influence athletics has on the community, while encouraging, promoting and engaging in philanthropic activities in professional and collegiate athletics. Purpose Driven Baseball The mission of Purpose Driven Baseball is to equip and train young men not only for the sport of baseball but more importantly for LIFE with Purpose. We feel that our purpose in life is rooted in, established by and sustained through a personal relationship with Christ. Through Purpose Driven Baseball camps and clinics, players will receive baseball instruction, but more importantly, players will be exposed to lessons beyond the sport – valuable life lessons and character building.The funds generated through donations and camps will be used to fulfill the mission of Purpose Driven Baseball here and around the world. Purpose Driven Teams and Coaches have conducted clinics and have competed in the Czech Republic, Germany, Austria, Slovakia, Italy & Hungary. We have a non profit organization called MVP4Life. MVP4Life is a non profit organization that teaches youth life skills through the game of baseball. MVP4Life youth participate in a comprehensive program of baseball and life skills training that promote the physical, educational, and life skills necessary to prepare them for leadership in their community and success in their personal lives. MVP4Life developed a comprehensive set of programs incorporating the MVP4Life’s HOMERUNS Life Skills Curriculum. These programs provide constructive activities of life skills to ensure success in school, in the community, and in life. “If it is to be…It is up to me” principle is instilled in students as they progress through MVP4Life’s HOMERUNS Life Skills Curriculum. Collegiate Players sharpen their skills amongst fierce competition in their off-season. In exchange for playing in the league, players mentor youth and instill the work ethic it takes to be a student athlete. Participants receive instruction in a clinic setting and practice skills in team format play. MVP4Life’s HOMERUNS Life Skills Curriculum is integrated throughout the program and instructors routinely demonstrate how these skills apply to situations in all aspects of life. MVP4Life strives to educate area coaches with clinics to provide them with the baseball and life skills it takes to be successful with their teams. Hello- Doug and Sara- I am Lorraine Carrier along with Mark Hornbaker and Paul Pasi Samela we are the Goodwill Ambassadors for The Gurkha Crew-Club Baseball in Laltipur, Nepal. This is a group of boys ages 12-17, Who along with their founder Dinesh Bajagain are promoting baseball for the first time in Nepal. Mr. Bajagain has done magazine, newspaper and radio interviews about the club and has created a safe haven where the boys can learn the sport and be kept away from drugs and crime. Nepal is one of the poorest countries in the world and I am raising funds for them on The West Coast (they have a Go Fund Me page) and Mark has worked with Pitch In For Baseball to send them needed equipment from the East Coast of USA, Paul is helping in Finland. This is a start but they still are in need. If you could please help us! Thank you. Hi – I Lorraine Carrier, along with Mark Hornbaker and Paul Pasi Samela are the Goodwill Ambassadors for The Gurkha Crew-Club Baseball in Laltipur, Nepal. This is a group of boys ages 12-17 who a long with their founder Dinesh Bajagain are promoting baseball for the first time in Nepal. Mr. Bajagain has done magazine, newspaper and radio interviews about the club and he has created a safe haven where the boys can learn the sport and be kept away from drugs and crime. Nepal is one of the poorest countries in the world and I am trying to raise funds for them here in California ( they have a Go Fund Me page) Mark working along with Pitch In For Baseball has sent needed equipment to them from the East Coast and Paul is helping in Finland. This is a great start but they still need la lot of help. If you or another organization can help that would be great. The club has a face book page and you can also contact Mr. Bajagain at his face book page as well. Created by the Rotary Club of Denver, the Branch Rickey Award is a nationally prestigious and coveted honor that recognizes professionals in Major League Baseball for exceptional community service. The award was named in honor of Branch Rickey, known to millions of fans as “Mr. Baseball” who was voted “Most Influential Person in Sports in the 20thCentury” by ESPN’s SportsCentury panel. For more information and to nominate your choice for the 2014 award, visit our website. I would like to introduce you to the Sons of Baseball Foundation! The easiest way to describe what we do is that we are like the Make-A-Wish Foundation, except our only focus is Baseball! In 2012 we provided our firs MVP Experience (our version of Make-A-Wish) for Nathan and his family with the Angels. Our goal last year was to provide 5 MVP Experiences and we completed 14! Our goal for this year is 20 and we are on pace to do that. We currently work with 11 MLB teams, one Triple A team (Salt Lake Bees – Angels), and my alma mater, the University of Utah where I finished my baseball career. We received our 501(c)3 last summer and continue to gain a tremendous amount of support from those passionate about helping children through baseball. Here is a link from our new website (not live yet) that will help you better understand what we do. Thank you in advance for reviewing this information. Thank you very much for letting me know about the charity. It sounds like a great cause and I would be honored to put that charity on our list. We will take a look at the site and be in touch with them and hopefully have it on our list soon. Thanks for bringing it to my attention.